Brat enjoying the spoils at 12,000 feet along Trail Ridge Rd. What can we say about Brat? Words will most definitely fall short, regardless of what we try to convey here in our little blog. He was a fixture here. He was McGregor. 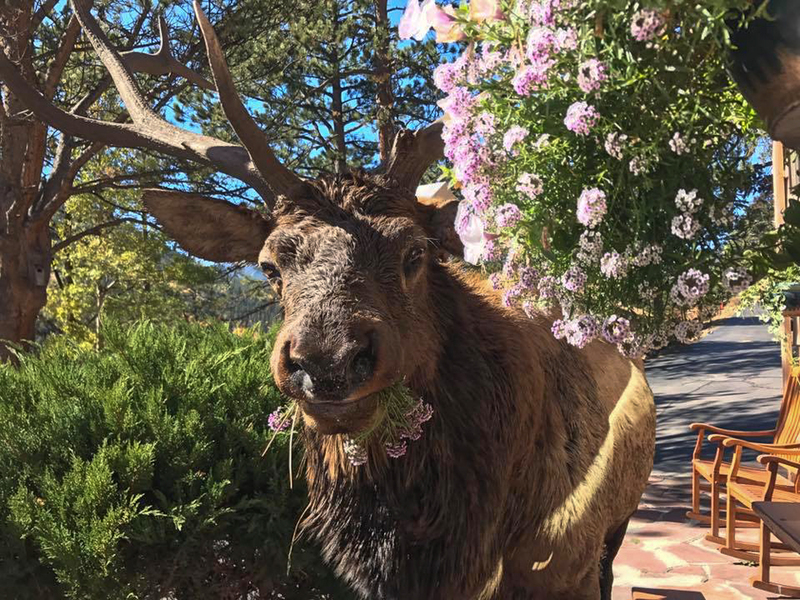 People from around the globe knew him and folks just passing through town would often swing by the lodge for even a chance to get a glimpse of this majestic, and lovable, Rocky Mountain Elk. Guests would revel in delight to find him catching some zzz's on their cabin's front porch as they enjoyed their morning coffee. Brat will truly, truly, be missed. 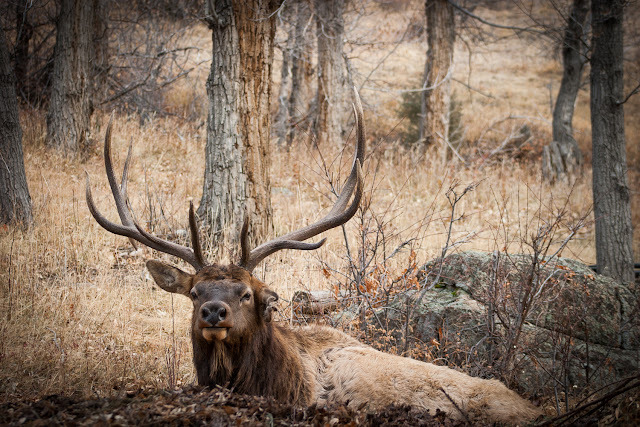 Yes, the Estes Valley and Rocky Mountain National Park are literally teeming with elk. So what made Brat so special? His personality and his love of our sunny hillside, that's what! His proximity to our guests and his docile demeanor played a large role as well. And his loyalty. He was a fixture here since 2008, and made appearances, when Lefty was the dominant bull in our valley, for a few years before that. 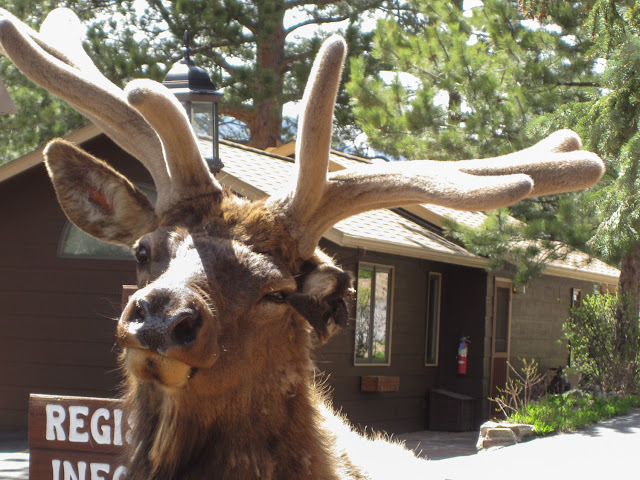 In this blog post, we just want to highlight Brat's life here at McGregor and in northern Rocky Mountain National Park. Brat being a brat and eating all of our pretty flowers! Well, simply, because he was a brat! Steve, our maintenance guru, named him as he had to deal with Brat on a daily basis as he would do his chores around the property. Brat was curious and would run Steve away from his golf cart to get a closer look. He'd keep Steve from entering a cabin by planting himself in front of the door refusing to move. And he'd hiss at you if you got too close. Yes, he was a little brat! 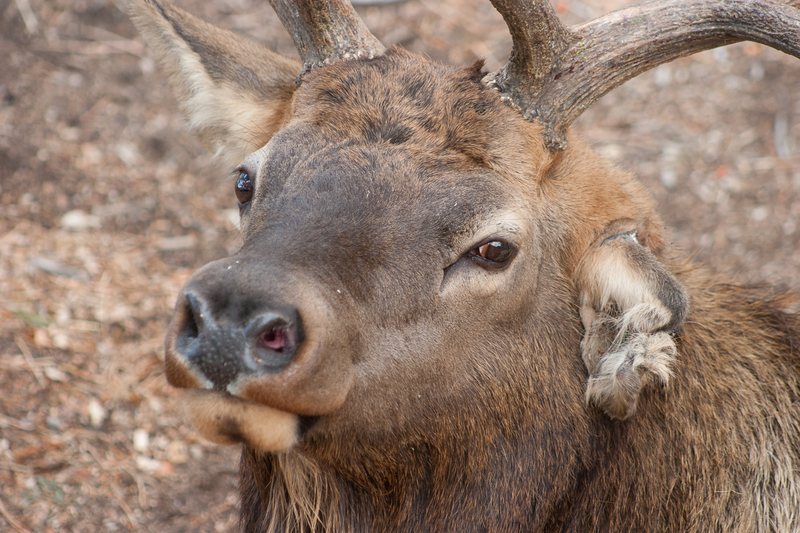 Many of you may remember our first resident elk. Well, at least the first we named and really got to know. Lefty was a fixture here at McGregor for years! He was easy to identify in his first couple of years because his right antler would always break during the rut leaving his left antler tall and proud! Hence the name Lefty. He also, later, went blind in his left eye and it was foggy, making him easy to spot even during years both his antlers stayed in tact. Brat showed up several years after Lefty made McGregor his home and was quite ornery, earning him his name, Brat. Brat would always bring his buddy, Little Boy, along as well. They would stay up on the mountainside while Lefty napped in front of a cabin. Brat would get brave enough, occasionally, to mosey down and join the party, but Little Boy was always skittish and wanted nothing to do with any of us. Over time, Brat and Lefty got more comfortable around each other and soon Brat was a fixture here on a daily basis. Lefty was certainly the dominant bull, running Brat out of his territory, his favorite spots, and easily holding his ground in any disagreements. But, as we all do, Lefty got older, and Brat was soon able to get the upper hand in their turf "battles." These skirmishes were more a display of bravado than aggressive attacks of any sort. A kin to playing a weak game of chicken. Well, Lefty started chickening out and resigned to the beta bull in the valley with Brat being a brat and imposing his ornery dominance. Often, if a golf cart here at the lodge got too close, he'd let out an audible "hisssss" letting us know who really owned this piece of land... and it wasn't us! Chilling in front of a Columbine Cottage on a frigid morning. The inevitable happened and one autumn Lefty didn't return. The rut is hard on these bulls. They forgo eating, drinking, and any other type of self preservation in their relentless quest to pass on their genes to the next generation. They'll sleep some, if the other bulls in their area are taking a little break as well. They are always on guard and usually on the move, circling their harem, and pursuing their life's calling as a true polygamous gentleman. Inherently, this isn't a sustainable way of life, which is why they prepare all year for the long month of the rut. As the bulls get older it takes a bigger effort to stay healthy and can often lead to death. It's just too much for their ailing bodies to handle. We knew Lefty was old and we weren't surprised that he didn't return. This fully opened the door for Brat! 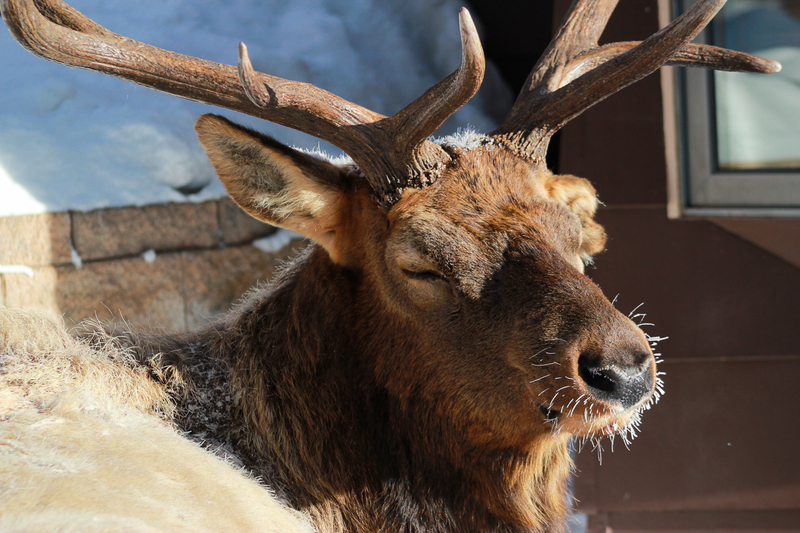 He settled right in as the sole bull here on our sunny slopes. I think the lack of competition also mellowed him out a bit. Once Lefty was gone, Brat showed no signs of agitation, ever. He became a gentle giant. If he was sleeping next to a cabin, we could often walk right by him as we did our daily housekeeping. He wouldn't give us a second look. Our pups didn't even worry him. I'm sure you've seen the picture in our lobby of Brat and Tanner napping together in the snow. Brat was a joy to have around! A goofy looking Brat just after shedding his antlers. It was the same story year after year. Come end of October, early November, Brat would return. He would come back looking proud but tired. He'd do a lot of sleeping and relaxing, making his rounds through the property, with a quick trip down to the river a couple of times a day. We see him almost daily, but he would wonder around the valley occasionally. He'd be spotted down valley on the slopes of Castle Mountain, or up near Aspen Glen Campground. But he'd always make his way back to McGregor. It was like welcoming a guest back time and time again! Brat looking a bit soggy during a winter storm. We have more stories about Brat than we could possibly write about here. Needless to say, Brat was a fixture. He garnered his own following with weekly blurbs in our local newspaper, The Estes Park News, his fans would send us pictures from their sightings of him all over the park. In the summer we'd see him up on Trail Ridge Road, in the autumn he'd be spotted with his harem in Horseshoe Park or Moraine Park. He kind of had his own paparazzi watching his every move. Years went by with Brat at the helm. Even as he aged and was past his prime, he remained one of the dominant bulls in the area. But we did notice some differences in his appearance and demeanor, especially in the past few years. He came back one year with a fairly gruesome injury on his underside. It was obvious he was in physical pain and wasn't eating much. He would become especially distressed when he would urinate. It was a sad sight. As with Lefty, we didn't expect to see him come back that next year. But he made it back just the same. He seemed to be handling the discomfort fairly well and began acting like his old self again. But his injury seemed even worse. Maybe he simply learned to tolerate it better and it became his new normal. Either way, we had some hope that he would last a few more years. Brat made it back in early/mid October of 2016. He showed up one day on our hillside and just laid there in obvious pain. We called the DOW and let them know of his state and of his injury. They told us they were going to let nature take its course, which we expected. But I guess they got a few more calls from our neighbors because they finally decided to do a procedure to fix his little issue. They tranquilized him, went through the procedure, and it seemed to work wonders! He was also reported to be in perfect health otherwise. Great news! Brat was back to his old self! You could even see it in his eyes! He was happy, eating, and pain free! This lasted about three weeks. We noticed some odd behavior from him and he would disappear, from our property anyway, for longer stretches. When he would return he was noticeably skinnier each time. It was pretty worrisome. Steve, our long time maintenance man, even made the remark that he though Brat was dying. We all agreed. We were soon notified that the DOW would be putting him down. Of course we were heartbroken but we knew he was sick and in pain and that the inevitable was coming one way or the other. Brat lived a very long and wonderful life here in the Northern Rockies of Colorado. 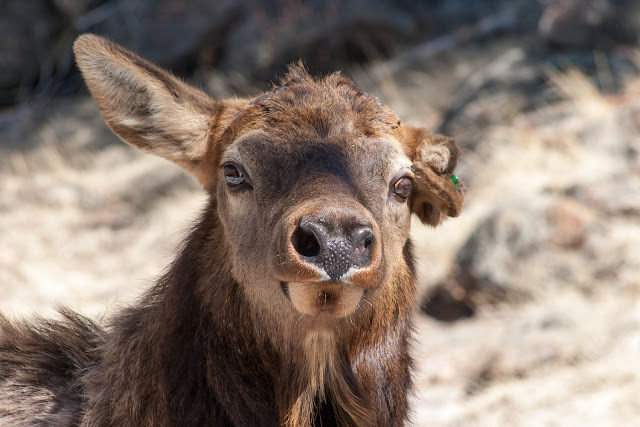 He is estimated to have been around 16 or 17, which is far longer than most elk live in the wild. They average around 13 years. He was already about 7 when he first became a fixture here in 2008. 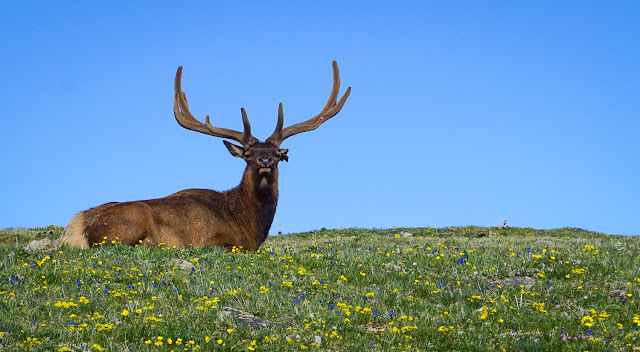 His prime (largest antler growth) came 2 years later, which would put him at 9 (maybe 10) in 2010. From then on his antlers were either close to the same size or a bit smaller with the past few years being considerably smaller and much more brittle (tines broken). It was a true joy having Brat as part of the McGregor Family for so long! Taking a rest along Trail Ridge Road. There is a lot that Brat left behind here at McGregor. Countless memories from guests and those of us here at McGregor, alike. Plenty of hilarious stories are included as well! There was a time when I was watching Brat with some guests as he made his way around the property just after a huge snowfall. He was walking in between a couple of our Columbine Cottages under some low branches and his antlers knocked about a ton of snow down on his head and neck! He was visibly annoyed, galloped a few steps, shook really hard and then looked over at us as if saying "can you freakin believed that just happened!!" It was so funny and one of the countless memories we'll all share. He (and Lefty) also taught us how to be better stewards of the land and how to responsibly live around wildlife. When we first bought the property we had standard wood bird feeders. We are known by birders throughout the country for our feeders and the wide variety of birds that visit McGregor for this reason. But seed can also attract elk and deer. While small amounts of seed isn't necessarily bad for elk, large amounts can be. 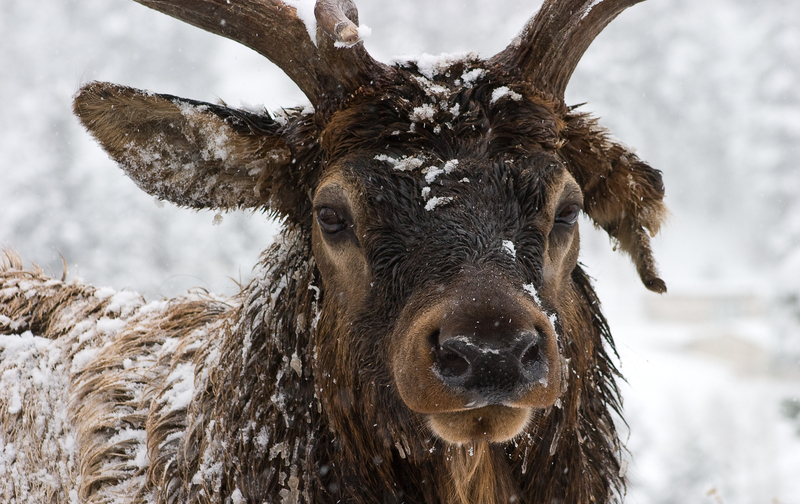 With the standard wood bird feeders, elk could easily access the seed. If they had trouble, they learned to just smash the feeders, let the seed spill out, and they'd simply eat it off the ground. To address this issue, we had metal feeders custom made by a welder in Rifle, CO that made it very difficult for elk to eat from. They have smaller openings and have grates that the seed falls through. The birds can still get to it, but the elk have a harder time getting their tongues in the grates to pull the seed out. We put about $4,000 into these feeders as an effort to take better care of the elk. While it didn't stop the problem completely, it definitely helped! In addition, we learned that if you just stop putting feed in the feeders for a day or so, the elk completely lose interest. These metal feeders are also able to be cleaned thoroughly. We will often take them down, wash them out, soak them in bleach, wash them again, and put them back up. This primarily helps to keep communicable diseases from spreading between species of birds (pigeons carry a lot of disease, for example), but it also keeps elk from spreading disease if they come to the feeders. You just cant do that with wooden feeders. They don't last too long if you soak them in water and bleach! But, even with these efforts there is more to be learned. 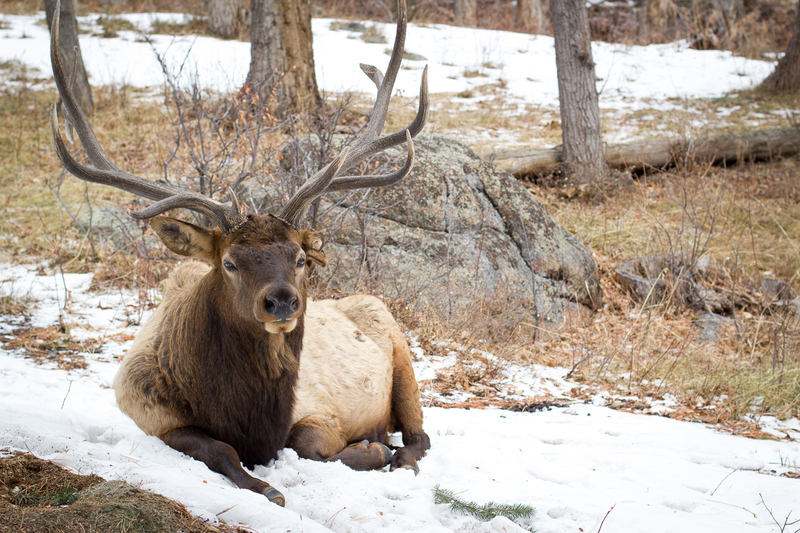 We have also started monitoring what elk is in the area and feeding the birds when they are off the property. We are also looking into other systems to make the bird feeders higher so elk can't reach them but making them accessible enough to easily fill them. Brat was an icon and a steward himself. Providing the opportunity for those who loved him to learn more about coexisting with our natural world and experiencing the majesty that these Rocky Mountains hold in their heart. Thanks for everything Brat! You will always be a part of our hearts and a massive bright spot in all of our memories from McGregor! Some animals leave a trail of glory behind them. They give their spirit to the people and places where they have lived, and remain forever a part of the rocks and streams and the wind and sky. One of the first pics of Brat that we got. Autumn of 2008. Thank you for sharing Brat's story. My favorite photo is with the flowers in his mouth! Truly a character and indeed a gentle giant. Still hard to wrap my mind around that he's gone but he lived a long life and was so loved by all of you and so many others. 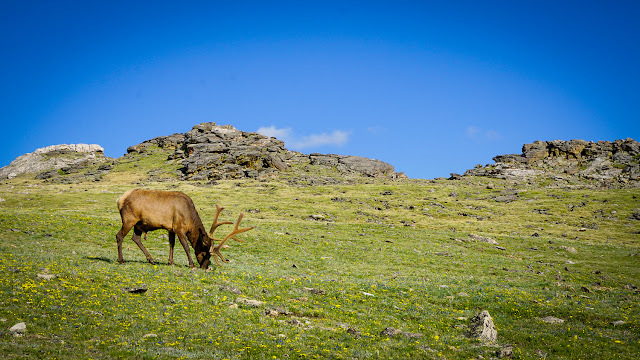 Thank you for being good stewards, caring for the wildlife while offering a glimpse of the beauty of Estes to visitors. Thank you for sharing Brat's story. It is always sad to say good by to these beautiful animals. I could feel the emotion in your story. We have had the honor of meeting Brat 4 times and was truly sorry to hear of his passing. But, happy that he lived such a long time and was so well loved at McGregor. In reading your story, it has made it clear in our minds that this is where we will always stay at when we come to EP. Your love for the wild is wonderful! And we can bring our little dog with us too... that means a lot. Thank you for being such a great place to stay at.